Hi there! I’m a music lover, dancer, instructor and performer from namma Chennai(India). I started dancing professionally at the age of 8 at John Britto’s Dance Academy and was selected to be a part of their Junior Dance Company for 7 years. At John Britto’s Academy I was trained in Bollywood and Jazz and got the opportunity to perform at over 100 shows across southern India including award nights, TV shows, fashion shows and charity events. As part of the company, I performed with Falguni Pathak, R Madhavan, Rambha and various other Tamil Industry actors. During this time I was also selected as a child anchor at Splash Channel – a kids TV Channel. I vividly remember spending most of my school life rushing from school to dance rehearsals/shows and back to school, and I loved every single minute of it. I had to take a break from all this dancing when I was in high-school to prep for my board exams, but could not stay away from dancing for too long. So I joined the Swingers dance Company (Chennai) as a student. I wanted dance to be a bigger part of my day-to-day routine, so I auditioned during their company auditions and after a strenuous 3 month process and training, got selected as a company dancer at the Swingers Dance Company. At Swingers I was trained in Ballet, Jazz, Hip-hop, Dancehall/Reggae, Salsa and Bachata for 8 years. I started teaching classes at the age of 18 after being trained for a year with Prasanna Kumar, the Artistic Director. I went on to teach Jazz, Hip-hop and Contemporary classes for kids, teens, adults and also conducted Zumba classes for adults. I got to choreograph multiple pieces for the student showcases and was involved with the costume design, sound editing/selection, managing of technical rehearsals and shows. I was an artist and assistant choreographer for the Tamil song Vizhiyile Vizhiyile, from the movie 555 which won an award for Best Choreography. I have a strong background in technical dance training and instruction and feel very passionate about sharing my love for the art with others. My dance idol is Laure Courtellemont who created the Ragga Jam dance style (so awesome, right). 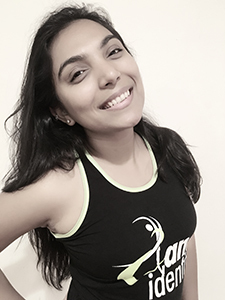 When I moved to California 2 years back, I desperately wanted to find a studio and company that shared my passion and love for teaching technically strong dance classes and quickly found Shaira Bhan and Dance Identity. At DI I fell in love with the energy of the team, quality of dance education and the vision they have for each and every one of their students. I truly believe that dancing can benefit people in numerous ways. I find dancing to be extremely therapeutic and wish that I can, in some way inspire everyone around me to just get up and start dancing!